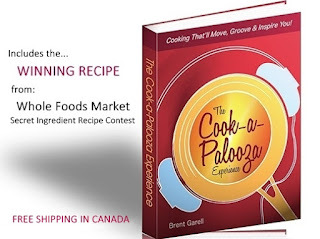 Follow on Facebook or by E-mail to get fresh Cook-a-Palooza recipes as soon as they are posted. 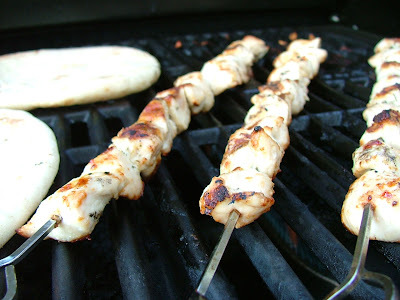 What do you get when you grill cubes of marinated chicken on skewers and then serve them on warm pita bread with a creamy garlic dill sauce? Hmmmm...I guess the title and picture pretty much answers that question. That’s o.k. because now you know what’s being served today on the Cook-a-Palooza blog! 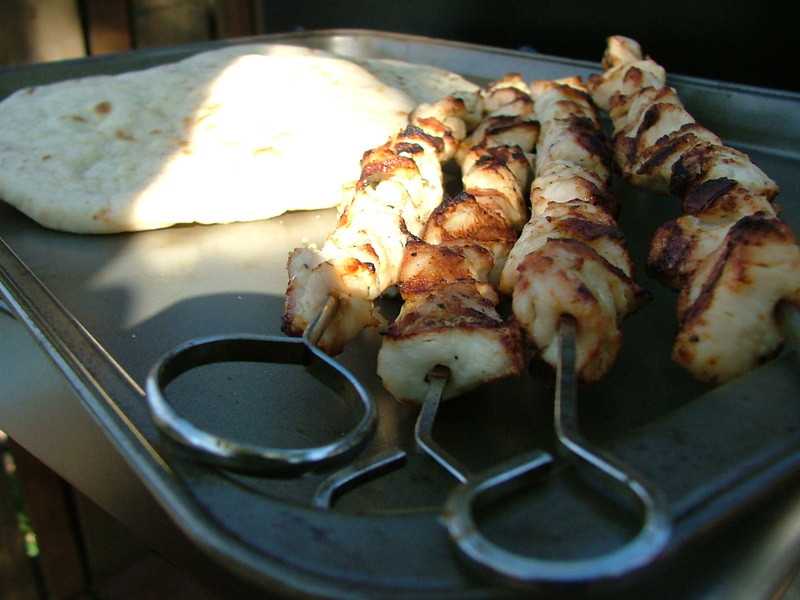 Skewered Chicken Pita Wraps! The beauty of this dish is the sauce for the pita doubles as a marinade for the chicken. I would have no problem serving this for lunch or as a satisfying sandwich dinner! What's not to like? 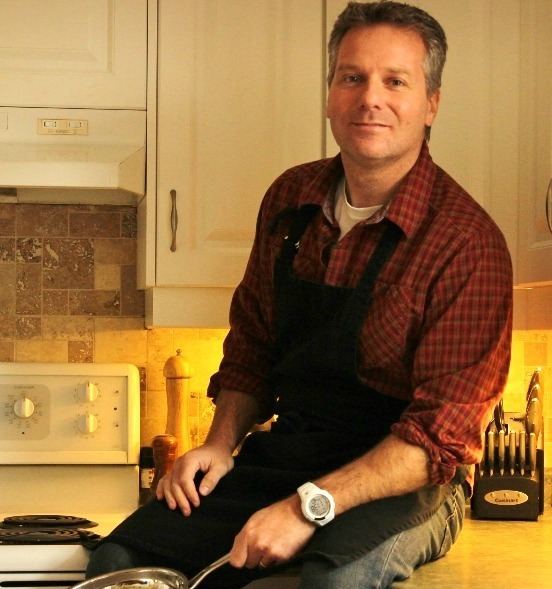 Hip Cooking Tip: You can easily put together a similar dish without cooking at all. Spread a creamy salad dressing (such as ranch) over a pita. Top with lettuce, slices of store bought roasted chicken and chopped red peppers. Voila! Fold and serve. Song Pairing: This sandwich had everything I needed for a hot summer night dinner… grilled meat, veggies, lightly toasted warm soft pita bread and a tasty sauce. The only thing missing was the cold glass of beer. For that reason I’m pairing this dish with the Blues Brothers cover of “(I got everything I need) Almost”. In a bowl whisk together, mayonnaise, oil, lemon juice, cheese, garlic, dill, hot sauce, salt and pepper. Set aside. In a separate bowl mix cubed chicken with 3 tbsp of mayonnaise mixture. Toss to coat. Cover and let marinate in the refrigerator for at least an hour. Place the chicken on skewers. Grill over medium heat until chicken is cooked through, about 8 to 10 minutes. Toast pitas on grill, turning once, until light golden brown, about 3 minutes. Spread reserved mayonnaise mixture over half of each pita. 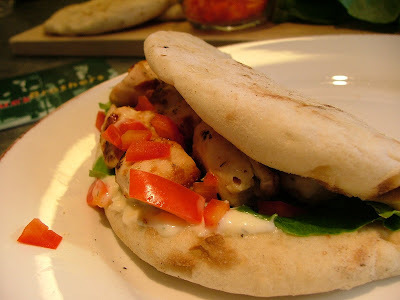 Place cooked chicken, lettuce and diced red pepper on pita. Fold pita over and serve. Recipe by Brent Garell (@kitchenroadie). Tested in the Cook-a-Palooza kitchen.